When will it snow in La Thuile? The next notable snow forecast for La Thuile is 3cm1in, expected on 24 April, with around 46cm18in forecast over the next 7 days. How High is La Thuile? The Italian Ski Resort of La Thuile is part of the Espace San Bernardo ski area with access to 160km99 miles of downhill skiing, with 77 marked pistes, served by a total of 37 ski lifts. In addition to the skiing in La Thuile itself (146km91 miles of pisted ski runs), the appropriate ski Lift Pass will allow you to ski or snowboard in the other Espace San Bernardo ski resort of La Rosière. With ski lifts as high as 2,610m8,563ft, skiing and snowboarding is assured throughout the season. The increasingly popular resort of La Thuile in the Aosta Valley is able to offer its visitors a choice of old or new. There's the traditional ski village with a dozen small family hotels that has grown out of four old mining villages now merged in to one. Then there's the modern slope-side hotel and apartment block complex in the shape of the giant Planibel, only a decade or so old. Visitors choosing to stay in any part of La Thuile can enjoy the spectacular views which take in the Matterhorn, Monte Rosa and Mont Blanc. La Thuile's component parts are the old villages of Thovex, Arly, La Golette and the largest and central Entrèves. Planibel contains more than 500 guest beds in a four star hotel and apartments complex, modern leisure and après ski facilities (Including gym, swimming pool and discothèque) and is right next to the gondola car or quad chair that take you straight up to 2200 metres, as well as the nursery slopes - in a word 'convenient'. The ski area is one of less than a dozen in the world where you can ski across the border, and one of two where you can ski from Italy in to France, in this case in to La Rosière, above Bourg St Maurice. The terrain stretches to 150km (93 miles) and is served by 35 lifts, almost half of them chairs. The longest possible descent in La Thuile is 11km7 miles long and the most difficult run is the 'No. 3, Franco Berthod', which is 1km1 miles in length. La Thuile has excellent skiing for all ability levels with north facing slopes, which along with its proximity to Mont Blanc, normally ensuring good snow conditions. There's a range of passes to suit all needs and a variety of terrain which can cater for everyone from beginner to expert. The resort has an on mountain TV system, with views of the various areas at the top of the mountain broadcast back to the base gondola station, along with constantly updated temperature and wind condition information, so it's possible to get a pretty good idea of conditions before you hit the top of the mountain. For beginners there are two gentle nursery slopes right next to the Planibel complex at the base of the resort, these have their own drag lifts and are separate to the main ski area. Intermediates will enjoy the terrain the most, accessing the slopes via the ultra modern DMC eight seater gondola with an hourly capacity of 3000 people and then returning at the end of the day on the 6km (4 mile) long red back down from the Fourclaz chair. In the interim covering seemingly endless blues and reds that radiate out to the peaks of Le Belvedere and Chaz Dura. From there you have a variety of routes over to La Rosière which sometimes offers the sunnier skiing. Look out for the Napoleonic Fort at the top of the Mountain (on the border) which is an interesting feature. The Petit St Bernard Pass comes over the mountain here and in winter the road is actually a ski run. Bizzarely you ski past a road sign with speed limits on it (though apparently no road in sight, so it appears as if it's a ski speed limit sign!). The other way up is the new Bosco Express high speed quad. Experts have twelve blacks to choose from, some of the steepest down through the woods above La Thuile itself. The runs are graded according to their steepest, with the best (worst?) a rather intimidating 72% plunge (although that steep bit is rather short and wide, so you can traverse it if you prefer to). An added bonus are the relatively safe and uncrowded off piste fields which tend to stay unskied for longer than at more crowded resorts on the other side of the border. Finally, La Thuile also has an efficient and reasonably priced (comparatively, again) heli-ski service by which it is possible to reach the snow fields of the Rutor glacier and Mont Miravidi. Apart from the local and cross-border ski passes there's an option of the Aosta Valley pass which covers 800km (500 miles) of terrain served by nearly 200 lifts in over a dozen ski areas, including Cervinia, linked to Zermatt and other famous resorts in the area such as Courmayeur (a 30 minute bus ride away) which is linked to Chamonix (lift ticket there at an additional cost, but just about physically possible to ski over if you set off on the early bus) and Pila. There's no ski bus so your own transport is most useful to make the most of that one although there is a free bus service within the resort itself. Cross country skiers have four loops covering a total area of 12 km. Snowboarders have a fun park to enjoy in La Rosière and the predominance of chair and gondola lifts makes getting around the big and varied area pretty well hassle free. The long blues and reds up above the treeline is great terrain and then down in the trees there are natural features to hit on. The only possible downer to be wary of are some flat sections on the La Rosière link. The rental shop in the Planibel complex is staffed by boarders who usually ensure that the best kit is available on rental and can also give advice on the best places at the time of your visit. Additionally the Snow Team La Thuile are a group of dedicated 'boarders who can be seen around the resort, occasionally organising events, and who can also offer advice. The Scuola di Sci La Thuile organises three and six day courses (Beginning on Mondays for beginners) of two hours per day. When is La Thuile open? We don't currently have confirmed season dates for La Thuile. NOTE:- Lift and Piste openings are always subject to Snow Conditions in La Thuile. 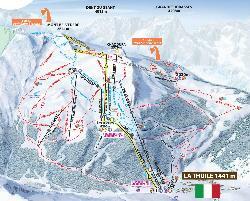 La Thuile is able to make snow, on 35km22 miles of ski runs, with 400 snow cannons. The 16 ski lifts of La Thuile are able to uplift 29,000 skiers and snowboarders every hour. La Thuile is in the Italian Alps in Aosta Valley, Italy. The nearest airports to La Thuile are Geneva, Annecy and Sion. There are 10 airports within three hours drive. The Webcams in La Thuile are not always up-to-date. Please check the date on the image to ensure you are seeing current snow conditions. In the early evening the various bars start to get lively, particularly establishments like Cage Aux Folles. Late night entertainment is provided in the Videodiscopub La Bricole in Entrèves and the Discoteca Fantasia in the Planibel complex. A good bar until the lifts close is the on mountain Roxy. Want to Know when it Snows in La Thuile? 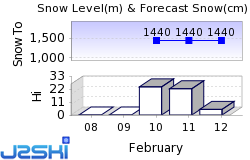 Click above to get Snow Reports by e-Mail for La Thuile. By doing so, you agree to Our Rules. Other Ski Areas within Espace San Bernardo. Other popular Ski Areas near La Thuile. Want to ask about skiing and snowboarding in La Thuile? Or contact La Thuile Tourist Office. Note :- The information on J2Ski concerning La Thuile, where not clearly factual, is opinion only and is neither definitive or exhaustive.